August | 2012 | Quidquid Est, Est! Question: Historically, were there women priests? This question is linked to the earlier post concerning Pope Joan and women popes. Let’s start this question off by answering the unasked question which must be dangling in the back of many of your minds: no, women can’t be priests. Similarly, men can’t be mothers. It’s not who we are. It’s not in the nature of males to be mothers; it’s not in the nature of women to be priests. We might go into the details of why women can’t be priests in a later post, but for now, let’s look at the historical question of women priests, because if women were priests in the past, then they could obviously be priests today. 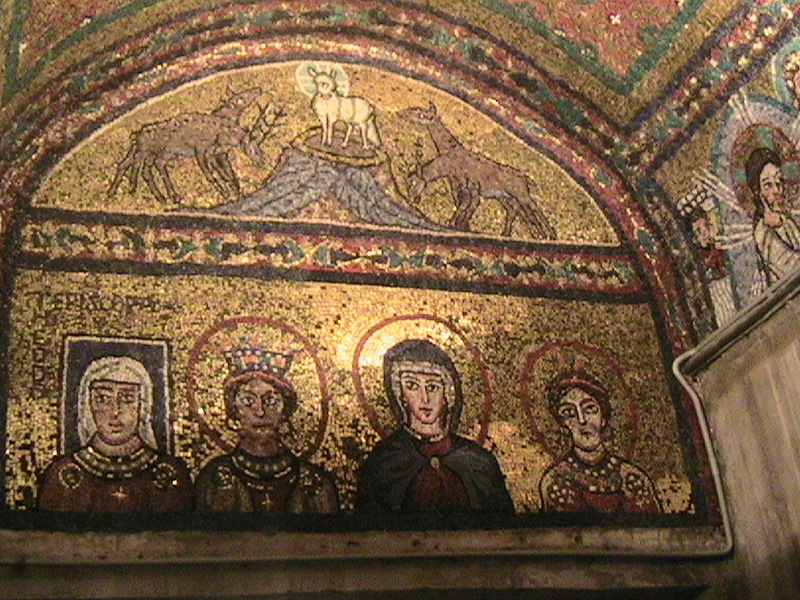 The historical evidence for women priests, or at least women receiving the sacrament of Holy Orders (through which a man is ordained first a deacon, then a priest, then a bishop, if he is so chosen) is compelling: mosaics in Roman churches with women dressed in what looks like clerical garbs and referred to as episcopa, which for all the world looks like Latin for “female bishop”; stories of certain sects in various parts of the early Church where women were ordained priests; frequent references to women known as “deaconesses” in several writings. There may even be Scriptural evidence in the New Testament letters. Such evidence, the argument goes, was suppressed by the misogynistic pope and bishops. Once again, we are faced with troubling evidence that appears to undermine an essential teaching of the Church. Never fear. Reality is here. I commend to you our sister Phoebe, a deaconess of the church at Cen’chre-ae, that you may receive her in the Lord as befits the saints, and help her in whatever she may require from you, for she has been a helper of many and of myself as well. The word translated as “deaconess” is diakonon, which normally means “deacon,” as the word is a masculine word. This does not prove, however, that Phoebe, described as a diakonon, is an ordained minister. Deacons in the early Church had many jobs. A woman who did similar jobs was probably called the same word, since there wasn’t a feminine equivalent in Greek. First Timothy 3:11 (RSV translation) reads as follows: “The women likewise must be serious, no slanderers, but temperate, faithful in all things.” The preceding and succeeding verses deal with deacons, specifically how they are to live and be model Christians to the community. The women mentioned in 3:11 could be deacons, but they could also be the deacons’ wives (verse 12 discusses how deacons are to act as husbands if they are married, saying “Let deacons be the husband of one wife, and let them manage their children and their households well”). The fact that verse 12 refers to the deacons as “husbands” implies that they are all males, and that the women referenced in verse 11 are the deacons’ wives. As the wives of deacons, these women would have had a special place in the community, and like their husband should be models of virtue. They could be such models without receiving Holy Orders. Besides, Paul earlier in 1 Timothy made that rather awkward statement about how women should “receive instruction silently and under complete control” (1 Tim 2:11; NAB translation). He likewise noted that “I do not permit a woman to teach or to have authority over a man. She must be quiet” (1 Tim. 2:12 ). Not really a ringing endorsement of women’s ordination. Further evidence for women clergy in the Church stems from artistic artifacts left in churches. Marcy refers to an “alcove in the Vatican depicting women priests.” In the Basilica of St. Prassede (or St. Praxedes) in Rome (not technically in the Vatican but rather down the street from the Basilica of St. Mary Major), there is a controversial work of art in a beautiful side chapel. On the wall of the chapel are four figures, saintly men and women to whom or for whom the chapel is dedicated. One of the figures is a woman with a nimbus (TRIVIA ALERT: A nimbus is a square halo surrounding the head of a figure in ecclesial art which indicates that the figure depicted was alive when the artist completed his work). Next to her image are two words which have sparked great controversy in the Church: “Theodora” (the woman’s name) and “Episcopa” (which appears at first glance to be a female version of the word episcopus, which is the Latin word for “bishop”). A picture of four figures. The one on the far left is Theodora. Note the “Episcopa” above her head. Bishop Theodora, eh? Sounds like women clergy to me. To make matters worse, the reigning pope at the time, Pope Paschal I (reigned 817 – 824), built the church of St. Prassede and, according to the records of that time, had the chapel with Theodora in it built to honor his mother Theodora. One historian, in writing of this mosaic, claims “We have papal authority for a woman bishop and an acknowledgement by the pope that he himself was the son of a woman bishop!” (Thomas F. Torrance, “The Ministry of Women: An Argument for the Ordination of Women“, Touchstone [Fall 1992]). 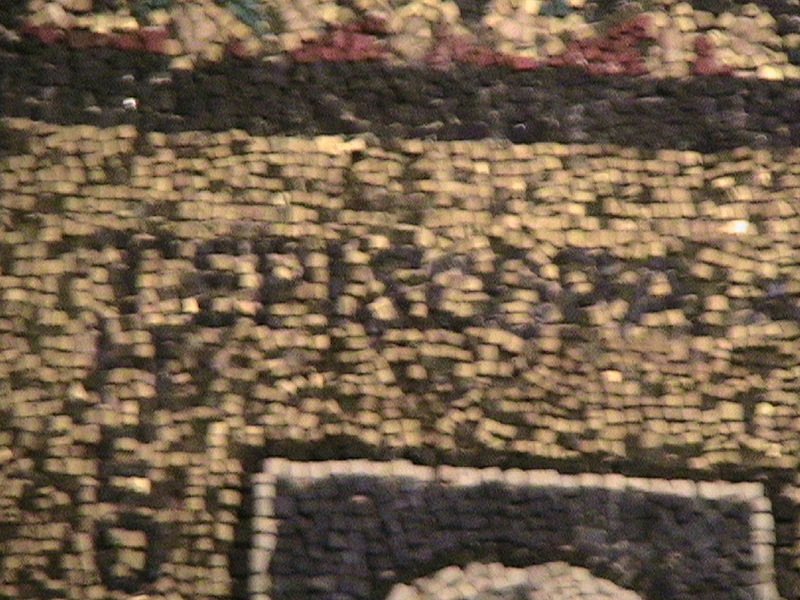 Close up of the word “Episcopa” if you can see it. Except it wasn’t a woman bishop. In fact, as far as historians can tell, there never has been a woman bishop. There is no historical record, besides this mosaic, that refers to a female bishop named Theodora. However, there are previous uses of a feminized version of episcopus. A local Church council in the city of Tours proclaimed in 813: “Let no entourage of women accompany a bishop who does not have a bishopess” (Patrick Henry Reardon, “Women Priests: History & Theology: A Response to Thomas F. Torrance,” Touchstone [Winter 1993], available at http://www.touchstonemag.com/archives/article.php?id=06-01-022-f). The reason for the canon from this council is clear: some bishops were surrounding themselves with women, causing scandal and more likely than not leading to severe breaks in the vow-of-chastity department. No women except for the bishop’s wife, the council declared (in Latin, the canon states “Episcopum episcopam non habentem nulla sequatur turba mulierum”), should be traveling around with the bishop. This means, of course, that some bishops were married (back in 1 Timothy 3:2, Paul notes that a should only be married once, which probably points to a no-remarriage-after-becoming-a-widow rule for bishops). Yes. And there were (and are) married priests in full communion with the Holy See. That is a discussion for another day. So episcopa might mean the wife of a bishop, in which case, Theodora was the wife of a bishop; hence her entitlement. Another possibility is that Theodora, following the death of her husband (Pope Pascal’s father), joined a religious order. This was a common practice in those days (many women saints were widows who joined monastic orders). Some historians arguing that Theodora was a bishop note that the figure in the church wears a coif or cap worn by nuns under their veil; the argument was that, because she dressed like a nun, she could not have been married, and thus could not have been Pope Paschal’s mother (see the essay by Reardon). However, it is just as likely that Theodora entered a convent as a widow, and perhaps became an abbess. For lack of a better word, she was referred to as an episcopa. It would not be the only instance in Church History of an abbess living and ruling her monastery like a bishop. St. Brigid of Ireland was reported to have accidentally been ordained a bishop, though the tale seems spurious, a hyperbole seeking to show just how powerful abbesses had become in Ireland and other parts of the Church. But a powerful abbess is not a bishop, no more than a powerful queen is a king. Are there reports of women acting as clerics in the medieval Church? There are. Were these women supported by the Church of their time? No. Throughout history, the Church Fathers spoke repeatedly against women clerics. Irenaeus condemned the use of priestesses in Gnostic sects during the late 2nd century; Tertullian noted that women are not allowed “to offer, nor to claim to herself a lot in any manly function, not to say sacerdotal office.” Hippolytus, writing in 215, gives one of the more direct rejections of women priests: “When a widow is to be appointed, she is not to be ordained, but is designated by being named [a widow]. . . . A widow is appointed by words alone, and is then associated with the other widows. Hands are not imposed on her, because she does not offer the oblation and she does not conduct the liturgy. Ordination is for the clergy because of the liturgy; but a widow is appointed for prayer, and prayer is the duty of all.” These quotes are all taken from an article posted on the Catholic Answers website; there are many more Church Fathers quoted. Likewise, a local council in Laodicea (held in 363) stated that “Presbytides, as they are called, or female presidents, are not to be appointed in the Church” (Canon 11). It is because of this Tradition in the Church that John Paul II taught infallibly that women cannot be priests. So here’s the bottom line: women have tried to be priests in the Church’s past. They were not successful in their endeavor, and the Church (both East and West) has always rejected women’s ordination. Historically, then, there were not real women priests. Catholic Answers, “Women and the Priesthood,” available at http://www.catholic.com/tracts/women-and-the-priesthood, accessed August 23, 2012. Patrick Henry Reardon, “Women Priests: History & Theology: A Response to Thomas F. Torrance,” Touchstone (Winter 1993), available at http://www.touchstonemag.com/archives/article.php?id=06-01-022-f, accessed August 23, 2012. William G. Most, “Women Priests?”, available at http://www.ewtn.com/library/SCRIPTUR/OTRANTO.TXT, accessed August 23, 2012. Question: What does “Ite, missa est” REALLY mean? Normally translated today as “Go, the Mass is ended,” “Ite, missa est” literally means “Go, it has been sent.” From this phrase we get the word “Mass” as well as the word “missal,” which is the name for the book containing the prayers of the Mass. As fascinating as this is, it does not answer the question of why perfectly sensible, very smart, and thoroughly-fluent-in-Latin people throughout the Church’s history insist on taking a phrase which clearly means “it is sent” and translating it as “the Mass is ended.” It boggles the mind! That means it’s time for some historical liturgical investigation. This has allowed for a wide range of interpretations concerning this phrase. St. Thomas Aquinas said it meant the offering of the Mass had been sent to God. In his Apostolic Exhortation Sacramentum Caritatis, Pope Benedict XVI discussed the development of missa from meaning “dismissed” to meaning one’s “mission.” “In antiquity,” the Holy Father writes, “missa simply meant ‘dismissal.’ However in Christian usage it gradually took on a deeper meaning. The word ‘dismissal’ has come to imply a ‘mission.’ These few words succinctly express the missionary nature of the Church (Benedict XVI, Sacramentum Caritatis, 51). None of this really gets at the origin of the word. I asked a former professor of mine at Christendom College, and he suggested it might refer to an ancient practice in Rome, where a deacon carried some of the Blessed Sacrament from the papal Mass to other parishes in Rome, to show unity between these other churches and the pope (See Fr. Grosch’s historical summary of this ritual. The declaration “Ite, missa est” would be the sign for the congregation to leave, because the Eucharist had been sent forth from the Church, and thus so should the people. However, I could not find a source independent of my professor to connect the “Ite” with the ancient custom. I hope that answers your question, Jane. If it didn’t, I hope it at least gave you some places to begin your search. Adrian Fortescue, “Ite Missa Est” in The Catholic Encyclopedia Vol. VIII (New York: Robert Appleton Company, 1910), available at http://www.newadvent.org/cathen/08253a.htm, accessed August 8, 2012. Fulton J. Sheen, Calvary and the Mass, available online at http://www.sanctamissa.org/en/resources/books/calvary/, accessed August 8, 2012.